There were many interesting games last round. The round ended with derby games, favorites losing the games and games ending by tiny margin. Here is the last round review presented by ESL. Sixth-ranked Botafogo F.R. (7-10) made lots of trouble for first ranked Pinheiros (15-3) in Sao Paulo on Saturday. Pinheiros managed to secure only two-point victory 69-67. However their fans expected much easier game. 25 personal fouls committed by Botafogo F.R. helped opponents get some easy free throw opportunities. The best player for the winners was power forward Renato Carbonari (206-87) who scored 21 points and 5 rebounds. The former international Betinho Nardi-Duarte (195-88) chipped in 16 points. Pinheiros' coach Cesar Guidetti used a ten-player rotation in such tough game. At the other side the best for losing team was center Ralfi Ansaloni (211-87) who recorded 16 points and 8 rebounds. Pinheiros have an impressive eight-game winning streak. They maintain first position with 15-3 record. Botafogo F.R. at the other side keeps the sixth place with ten games lost. They share the position with Bauru. Pinheiros will have a break next round, and it should allow them to practice more before next game. Botafogo F.R. will play on the road against Sao Jose (#8) and it may be a tough game between close rivals. Tenth-ranked Minas (6-11) made lots of trouble for second ranked Mogi (14-5) in Mogi das Cruzes. Mogi managed to secure only one-point victory 65-64. However their fans expected much easier game. It was a good game for the former international power forward Joao-Paulo Batista (205-81, college: Gonzaga) who saved his team from a defeat with a double-double by scoring 10 points and 22 rebounds. Guilherme Pereira contributed with 13 points and 5 rebounds for the winners. Mogi's coach Jorge Guerra allowed to play the deep bench players in such tough game. 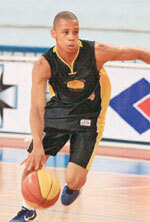 The former international point guard George-Yeye Torres (188-91) replied with 16 points and 4 steals for Minas. Mogi have an impressive five-game winning streak. Despite that victory Mogi went down to third position due to points difference. Minas at the other side keeps the tenth place with 11 games lost. Mogi will have a break next round, and it should allow them to practice more before next game. Minas will play at home against Paulistano (#5) and hopes to get back on the winning track. Another interesting game was a derby match between two local teams from Sao Paulo: Pinheiros (#1) and Paulistano (#5). Paulistano was defeated at home 85-91 and even the fact of playing on their own court did not help. It ended at the same time the four-game winning streak of Paulistano. Kenny Dawkins scored 18 points and 5 assists to lead the charge for the winners. The best for the losing side was Leonardo Meindl with a double-double by scoring 22 points, 13 rebounds and 4 assists. Both coaches used bench players which allowed the starters a little rest for the next games. Pinheiros (15-3) have an impressive eight-game winning streak. They maintain first position. Loser Paulistano keeps the fifth place with five games lost. Pinheiros will have a break next round, and it should allow them to practice more before next game. Paulistano will play against the league's second-placed Flamengo (#2) in Rio de Janeiro and hope to secure a win. Very important is a home loss of second ranked Mogi (14-5) against fourth ranked Flamengo (14-4) on Saturday night. Host Mogi was defeated by Flamengo in a tough game in Mogi das Cruzes 74-81. It ended at the same time the five-game winning streak of Mogi. It was a key game for the second position in the league. Anderson Varejao notched a double-double by scoring 23 points and 11 rebounds to lead the effort. Flamengo have a solid three-game winning streak. They moved-up to second place. Mogi at the other side dropped to the third position with five games lost. Flamengo's next round opponent will be Paulistano (#5) in Sao Paulo. Bottom-ranked Brasilia managed to get a fourth victory, breaking the four-game losing streak on Wednesday night. This time newly promoted Brasilia edged sixth-ranked Paschoalotto/Bauru 76-75. It ended at the same time the four-game winning streak of Paschoalotto/Bauru. The best player for the winners was Zach Graham who scored 24 points. Both coaches tested many bench players in such tough game. Brasilia (4-12) moved-up to thirteenth place, which they share with Joinville. Loser Paschoalotto/Bauru keeps the sixth position with ten games lost. Brasilia will face higher ranked Corinthians (#9) in Sao Paulo in the next round and it may be quite challenging game. B.Cearense was defeated by Botafogo F.R. in Rio de Janeiro 78-69. Joinville was smashed by Flamengo at home 50-89. B.Cearense won against Vasco Da G. on the opponent's court 79-77. The best stats of 18th round was 24 points and 7 assists by Yago Santos of Paulistano. Tenth-ranked Minas (6-11) made lots of trouble for second ranked Mogi (14-5) in Mogi das Cruzes. Mogi managed to secure only one-point victory 65-64. However their fans expected much easier game. It was a good game for the former international power forward Joao-Paulo Batista (205-81, college: Gonzaga) who saved his team from a defeat with a double-double by scoring 10 points and 22 rebounds. The former international guard Guilherme Pereira (190-91) contributed with 13 points and 5 rebounds for the winners. Four Mogi players scored in double figures. Mogi's coach Jorge Guerra allowed to play the deep bench players in such tough game. The former international point guard George-Yeye Torres (188-91) replied with 16 points and 4 steals and Wesley Ferreira (201-95) added 5 points and 11 rebounds in the effort for Minas. Mogi have an impressive five-game winning streak. Despite that victory Mogi went down to third position due to points difference. Minas at the other side keeps the tenth place with 11 games lost. Mogi will have a break next round, and it should allow them to practice more before next game. Minas will play at home against Paulistano (#5) and hopes to get back on the winning track. There was no surprise in Rio de Janeiro where 12th ranked SKY/Basquete (6-13) was defeated by sixth ranked Botafogo F.R. (7-10) 78-69 on Tuesday. The best player for the winners was center Ralfi Ansaloni (211-87) who scored 18 points. The former international point guard Henrique Coelho (183-93) chipped in 14 points and 6 assists. At the other side the best for losing team was center Douglas Kurtz (213-87, college: Hawaii) who recorded a double-double by scoring 14 points and 10 rebounds and guard Paulo Da-Costa (191-94) added 12 points respectively. SKY/Basquete's coach rotated eleven players in this game, but that didn't help. Botafogo F.R. maintains sixth position with 7-10 record, which they share with Bauru. SKY/Basquete lost fifth consecutive game. They dropped to the eleventh place with 13 games lost. Botafogo F.R. will face Sao Jose (#8) on the road in the next round. SKY/Basquete will play against Corinthians and it may be a tough game between close rivals. Bottom-ranked Brasilia managed to get a fourth victory, breaking the four-game losing streak on Wednesday night. This time newly promoted Brasilia edged sixth-ranked Paschoalotto/Bauru 76-75. It ended at the same time the four-game winning streak of Paschoalotto/Bauru. The best player for the winners was American guard Zach Graham (198-89, college: Mississippi, agency: Pro Sports) who scored 24 points. Andrezao Silva (198-90) chipped in 16 points (on 7-of-8 shooting from the field). At the other side the best for losing team was the former international point guard Larry Taylor (185-80, college: Missouri Western) who recorded 12 points, 7 rebounds and 5 assists and the former international power forward Lucas Mariano (208-93) added 10 points and 12 rebounds respectively. Four Paschoalotto/Bauru players scored in double figures. Both coaches tested many bench players in such tough game. Brasilia (4-12) moved-up to thirteenth place, which they share with Joinville. Loser Paschoalotto/Bauru keeps the sixth position with ten games lost. Brasilia will face higher ranked Corinthians (#9) in Sao Paulo in the next round and it may be quite challenging game. No shocking result in a game when fourth ranked Flamengo (14-4) smashed on the road bottom-ranked Joinville (4-12) 89-50 on Thursday. Flamengo dominated down low during the game scoring 58 of its points in the paint compared to Joinville's 24. They outrebounded Joinville 49-30 including 17 on the offensive glass. The best player for the winners was Bahamas forward David Nesbitt (200-91, college: St.Thomas, FL) who had a double-double by scoring 11 points and 10 rebounds. The former international Marquinhos Vieira (207-84) chipped in 11 points and 7 rebounds. Four Flamengo players scored in double figures. At the other side the best for losing team was point guard Jeferson Froehlich (193-91) who recorded 7 points and 9 rebounds and center Thiago Mathias (208-89, college: N.Mexico JC) added 11 points respectively. The winner was already known earlier in the game, so both coaches allowed to play the bench players saving starting five for next games. Flamengo have a solid three-game winning streak. They moved-up to second place. Joinville lost eighth consecutive game. They dropped to the bottom position with 12 games lost. Flamengo will face Paulistano (#5) in Sao Paulo in the next round. We cannot really consider it an upset in the game between close teams in Rio de Janeiro where 11th ranked Vasco Da G. (5-12) was edged by twelfth ranked SKY/Basquete (6-13) 79-77 on Thursday. SKY/Basquete dominated down low during the game scoring 54 of its points in the paint compared to Vasco Da G.'s 34. The best player for the winners was naturalized Italian point guard Paulinho Boracini (183-84) who scored 26 points. American point guard Farad Cobb (183-93, college: Cincinnati) chipped in 14 points and 6 rebounds. At the other side the best for losing team was American guard Deonta Stocks (185-88, college: W.Georgia) who recorded 23 points and 6 rebounds and the former international center Caio Torres (211-87, agency: Interperformances) added 15 points and 13 rebounds respectively. Four Vasco Da G. players scored in double figures. Both coaches allowed to play bench players in such tough game. SKY/Basquete moved-up to eleventh place. Loser Vasco Da G. dropped to the twelfth position with 12 games lost. SKY/Basquete will face higher ranked Corinthians (#9) in Sao Paulo in the next round and it may be quite challenging game. Very important is a home loss of second ranked Mogi (14-5) against fourth ranked Flamengo (14-4) on Saturday night. Host Mogi was defeated by Flamengo in a tough game in Mogi das Cruzes 74-81. It ended at the same time the five-game winning streak of Mogi. It was a key game for the second position in the league. Flamengo had a 31-19 advantage in offensive rebounds. The former international center Anderson Varejao (211-82) notched a double-double by scoring 23 points and 11 rebounds to lead the effort and Argentinian point guard Franco Balbi (185-89) supported him with 18 points, 8 rebounds and 5 assists. Even 20 points and 7 rebounds by naturalized American Shamell Stallworth (195-80, college: USF) did not help to save the game for Mogi. The former international power forward Joao-Paulo Batista (205-81, college: Gonzaga) added 13 points and 7 rebounds. Four Mogi players scored in double figures. Flamengo have a solid three-game winning streak. They moved-up to second place. Mogi at the other side dropped to the third position with five games lost. Flamengo's next round opponent will be Paulistano (#5) in Sao Paulo. Sixth-ranked Botafogo F.R. (7-10) made lots of trouble for first ranked Pinheiros (15-3) in Sao Paulo on Saturday. Pinheiros managed to secure only two-point victory 69-67. However their fans expected much easier game. 25 personal fouls committed by Botafogo F.R. helped opponents get some easy free throw opportunities. The best player for the winners was power forward Renato Carbonari (206-87) who scored 21 points and 5 rebounds. The former international Betinho Nardi-Duarte (195-88) chipped in 16 points. Pinheiros' coach Cesar Guidetti used a ten-player rotation in such tough game. At the other side the best for losing team was center Ralfi Ansaloni (211-87) who recorded 16 points and 8 rebounds and forward Diego Conceicao (200-87) added 12 points and 5 rebounds respectively. Pinheiros have an impressive eight-game winning streak. They maintain first position with 15-3 record. Botafogo F.R. at the other side keeps the sixth place with ten games lost. They share the position with Bauru. Pinheiros will have a break next round, and it should allow them to practice more before next game. Botafogo F.R. will play on the road against Sao Jose (#8) and it may be a tough game between close rivals. Another interesting game was a derby match between two local teams from Sao Paulo: Pinheiros (#1) and Paulistano (#5). Paulistano was defeated at home 85-91 and even the fact of playing on their own court did not help. It ended at the same time the four-game winning streak of Paulistano. American point guard Kenny Dawkins (175-87, college: Lamar) scored 18 points and 5 assists to lead the charge for the winners and the former international Betinho Nardi-Duarte (195-88) chipped in 16 points during the contest. The best for the losing side was international Leonardo Meindl (201-93) with a double-double by scoring 22 points, 13 rebounds and 4 assists and international point guard Yago Santos (178-99) scored 24 points and 7 assists. Four Paulistano players scored in double figures. Both coaches used bench players which allowed the starters a little rest for the next games. Pinheiros (15-3) have an impressive eight-game winning streak. They maintain first position. Loser Paulistano keeps the fifth place with five games lost. Pinheiros will have a break next round, and it should allow them to practice more before next game. Paulistano will play against the league's second-placed Flamengo (#2) in Rio de Janeiro and hope to secure a win.